Sensō-e, literally “war pictures,” are a particularly dramatic form of Japanese woodblock print that emerged as a style of reportage during the Satsuma Rebellion of 1877, and went on to become a widespread and popular way of disseminating patriotic imagery during the First Sino and Russo-Japanese wars. The 2017 catalog “Flash of Light, Fog of War” features 75 of these images and was produced following a donation of a private collection to the Ackland Art Museum at the University of North Carolina at Chapel Hill. 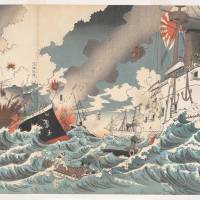 Flash of Light, Fog of War: Japanese military Prints 1894-1905, by Bradley M. Bailey, Gene Roberts, Katie Ziglar. Sensō-e — reproducible images made to depict current events — were not intended to be appreciated as “fine” art by a cultured elite. They were, however, meant to be eye-catching and sensational and, whatever their aesthetic aspirations, it was incumbent on them to deliver. 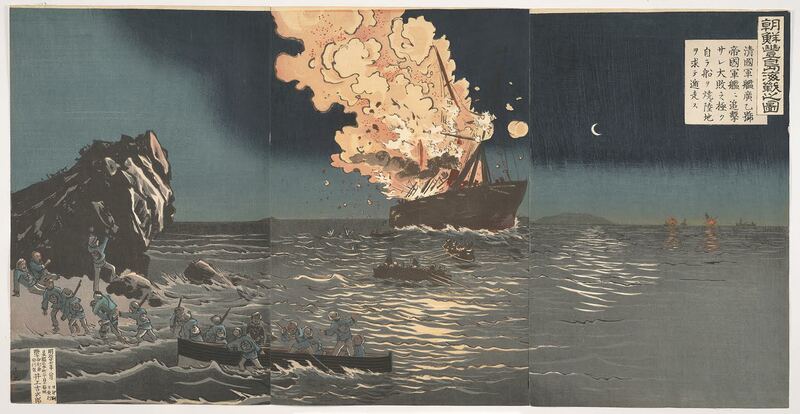 During Japan’s industrialization in the Meiji Era (1868-1912) the woodblock prints business was on the decline, and sensō-e were, to some extent, an effort to make bank in a trade that was to be made redundant by the spread of photography. Several factors contributed to the distinctive style of sensō-e. The depiction of modern firearms and military uniforms, armored battleships and anatomical realism in the medium of the woodblock print make for a singular kind of image, of course, but Ackland Art Museum’s curator of Asian art, Bradley M. Bailey, focuses on two particular visual features of sensō-e: the way light and obscurity are depicted. 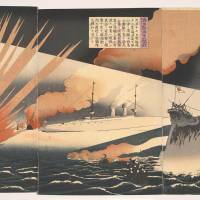 To depict artillery, searchlights and ships extravagantly bursting into flames required experimentation with new kinds of visual techniques. 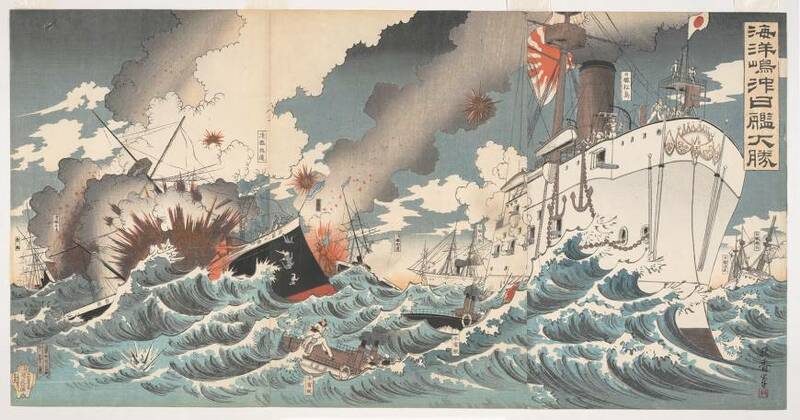 Woodblock artists were not embedded war correspondents and their frame of reference was not first-hand experience at the front lines, but photographs, news reports and literature, such as the popular memoir “Human Bullets,” written in 1904 by Tadayoshi Sakurai (1879-1965). 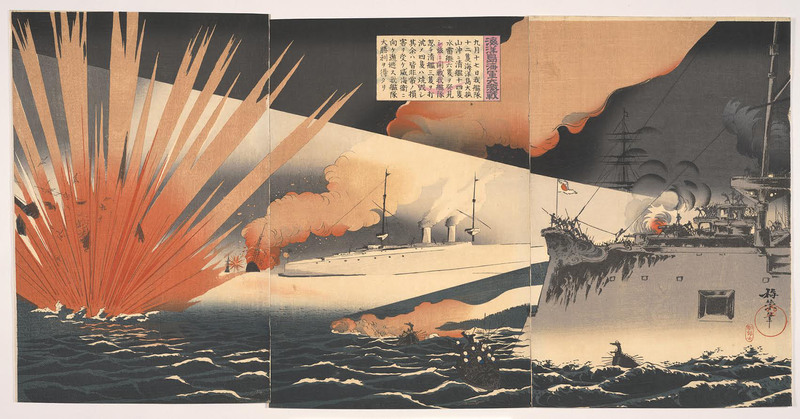 This resulted in stylized, almost avant-garde, lighting effects of globules of red flame, hard-edged cones of white against black backgrounds and, perhaps inevitably, explosions that resemble the rays of the Rising Sun flag of the Japanese armed forces. Another innovation was a response to the fact that, in contrast to the more honourable practice of fighting in the daytime, when you could identify yourself and your opponent, modern warfare often took place at night. 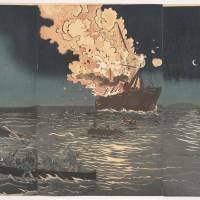 Bailey points out that while night scenes are not uncommon in earlier examples of ukiyo-e, the illumination and coloration of subjects would not necessarily be different from that of a daytime image. Sensō-e show strong directional lighting — from camp fires, artificial light, explosions, etc. — and the resulting shadows are used to suggest tension, threat and violence. Bailey also notes that sensō-e are distinctive in their treatment of smoke, fog, haze and snow. Previously in woodblock prints, the color white would be represented by the base paper being revealed through an absence of ink. However, printers in the late-19th century started to use the white, opaque powder gofun, derived from calcified oyster and clam shells, to create more nuanced representations of the snowy conditions that afflicted soldiers of all sides. Sensō-e vary considerably in quality, the work of Kiyochika Kobayashi (1847-1915), generally being considered to be among the best of the genre. With their bellicose nature and anachronistic mix of modern subject matter and Japanese woodblock print visual language, sensō-e is a curious sub-genre that has been given something of a wide-berth by art collectors. After realizing that the prints were unreliable as journalistic testimony, Roberts’ appreciation of them as visual imagery grew. The jingoism of sensō-e, in which Chinese people are depicted as subservient and backward, while Japanese troops stand proud, is certainly unsettling, but at the level of dynamic composition, kitsch and melodrama, they do have an undeniable appeal. Academic interest in sensō-e is building, and Bailey graciously acknowledges that, in 2016, Rhiannon Paget, a contributor to The Japan Times, and curator Philip K. Hu organized “the most authoritative and comprehensive historical resource on this material” at the St. Louis Art Museum. That publication, “Conflicts of Interest: Art and War in Modern Japan” enjoys higher production values, and is more substantial in terms of textual entries and breadth of content. However, focusing on the presentation of the images themselves, Bailey’s catalog provides an immersive experience of these quirky visualizations of Japan’s glory days. Order “Flash of Light, Fog of War” at acklandstore@unc.edu.